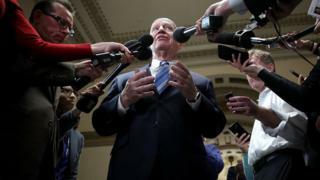 US Republicans from both houses of Congress have revealed their joint bill for the biggest overhaul of the country's tax system in 30 years. The plan brings the US corporate tax rate down to 21% from the current 35%. The top individual income tax drops to 37% from 39.6%. Democrats have argued that the tax cuts will favour only the rich and offer little to the middle class. The non-partisan Joint Committee on Taxation said on Friday the measures would add as much as $1.4tn (£1tn) to the $20tn national debt over 10 years. What is in the final version of the US tax plan? Reality Check: Will tax plan hurt Trump? Friday's agreement came after hours of talks in which the bill's supporters sought to win over wavering Republicans. Can tax bill boost Trump in polls? The pieces are falling in place for Donald Trump's tax bill, which now seems almost guaranteed to become law. This will certainly satisfy critics within the Republican Party, particularly the big-business donors, who were lamenting Congress's inability to enact even modest parts of their party's legislative agenda. The question, however, is whether the success here will do anything to reverse the president's low poll numbers and dispel the growing consensus that Republicans are in for a rough ride in next year's mid-term congressional elections. At the very least this will make it easier for the party incumbents to survive primary challenges from anti-establishment outsiders who otherwise would have railed against a do-nothing Congress. The tax bill's overall unpopularity according to recent polls, however, may do little to improve the party's standings in the eyes of the general public. Cutting corporate tax rates, whether or not it is in the long-term interest of the nation, is unlikely to capture the imagination of the average American. Republicans are now in a position to fully take credit for a booming economy, however - and they have 11 months to make the case to voters that they deserve to stay in power. The proposed new measures ran into opposition from a senior UN official on Friday, who said they could worsen social inequality in the US. Philip Alston, the UN Special Rapporteur on Extreme Poverty who has been on a two-week fact-finding visit to US States, said the tax bill threatened to "blow apart" social welfare provision. "The US Congress is trying desperately to pass a tax bill that, if adopted, would represent the single most dramatic increase in inequality that could be imagined," he said. What sticking points remain on US tax plan?